Thanksgiving is a little more than a week away! Can you believe it? I’m so excited! There is nothing quite like how our homes feel on Thanksgiving. I’m not sure if it’s being around lots of family, or the fire crackling, or if it’s just in the air – but it’s something we all crave and love. I know for me, the little moments and details play a big role. One year for Thanksgiving we had a few varieties of fancy popcorn flavors to snack on before we had dinner. There were spicy, sweet and smokey flavors to choose from. Everyone LOVED it! I remember we enjoyed it around a fire while spending quality time together and cracking jokes. That extra, unexpected detail really created an environment that was fun, energetic, and gracious. Looking back on that memory, it’s amazing how such a small detail could set the tone for the rest of the day and create such a lasting memory. Let’s get to it! 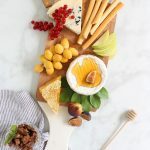 I’ve shared enough of these boards on the blog by now that you probably know my train of thought: use cheese or meat, fruit, crackers, dips, and briney things like olives that you enjoy, and assemble them on your favorite board. 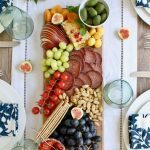 Check out my post How to Make a Charcuterie Board in 10 Minutes for tips on setting up the perfect food board. 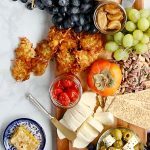 You can also check out my recent post on how to make the Easiest Fall Appetizer Board for more inspiration! One of my favorite things to do is to add in seasonal flavors. I added pomegranate arils, butternut squash, cinnamon sticks (for decor), and even popcorn. I also made a few homemade add-ons like my Maple-Spiced Pecans, Roasted Butternut Squash Chummus, and Cranberry Orange Chutney! You can pick and choose which homemade add-ons you’d like to make, but ALL of these really add amazing flavor and variety to the board. The maple-spiced pecans are probably my favorite. 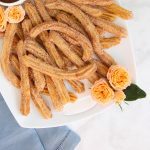 They are made with lots of warm spices like cinnamon and cloves and are so incredibly flavorful and comforting. I HIGHLY recommend making them. Plus they create the most amazing aroma while they bake in the oven. The roasted butternut squash chummus is my husband’s favorite! It’s perfectly savory like traditional chummus and has a hint of butternut squash to add a little taste of fall. I topped it with some roasted squash, pomegranate arils, and a drizzle of maple syrup. And that chutney? Think of it as homemade cranberry sauce kicked up a few notches. 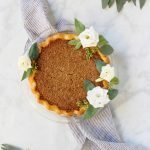 It has the perfect balance of sweet and tart, is perfectly spiced, and goes with almost anything! And look at that color! So much autumn goodness. I also added these empanadas. They are so delicious. 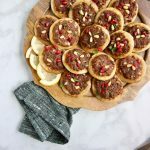 I mean who doesn’t love to snack on puff pastry appetizers? I filled some of these with ground beef, and some with sweet potato, but you can feature your favorite puff pastry app here. And although I love setting an app board right in front of my guests at the table (as pictured), you can set it up almost anywhere in your house. Maybe your living room by the fire? Or right on your kitchen island. Place the egg white and maple syrup into a large bowl and whisk vigorously until light and frothy. Whisk in the sugar, cinnamon, salt, cayenne pepper and cloves. Add the pecans and mix well, until thoroughly coated. Pour the mixture, including any liquid, onto the prepared baking sheet and spread into a single layer. Bake for 30 minutes, tossing twice with a metal spatula. Each time you toss the pecans, be sure to spread them out into a single layer again. Allow the pecans to cool completely before serving. Place the squash on a large sheet pan line with foil and drizzle with oil and sprinkle with salt, pepper, ½ teaspoon cinnamon and ½ teaspoon cumin. Bake for 35-45 minutes or until cooked through and tender. Reserve a few pieces of cooked squash for garnish. In a food processor fitted with a metal blade, process the cooked squash, chickpeas, tahini, lemon juice, garlic, cumin and cinnamon until coarsely processed. With the motor running, slowly pour in the water, a little at a time, until desired consistency. When ready to serve, place the chummus in a bowl and swirl the top with the back of a spoon. Top with pomegranate arils and reserved butternut squash and then drizzle with maple syrup. Mix all the ingredients together in a medium pot and heat over a medium flame. Bring to a boil and reduce heat to medium low. Cover, and allow to cook for 35 minutes, mixing twice, until the fruit is cooked down and tender. The Maple Spiced Pecans can be stored in an airtight container for up to 2 weeks. The Roasted Butternut Squash Chummus can be stored in an airtight container for up to 1 week. The Cranberry Orange Chutney can be stored in the refrigerator for up to 5 days.